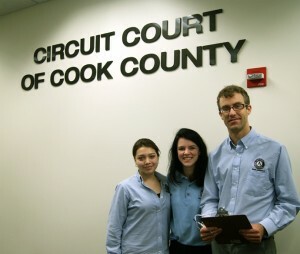 Illinois JusticeCorps is an innovative AmeriCorps program that places college student and recent graduate volunteers in courthouses throughout the state to help the growing number of litigants appearing in court every day without lawyers. Volunteers in the program make the courts a friendlier and more welcoming environment for litigants and other court patrons. The CBF launched JusticeCorps as a pilot program in 2009. Since then, the program has expanded to thirteen sites in eleven counties throughout Illinois. The CBF partners with the Illinois Bar Foundation and the Illinois Supreme Court Commission on Access to Justice to manage and administer the program, with additional support from the Serve Illinois Commission and the Corporation for National and Community Service. Last year, JusticeCorps volunteers served more than 57,000 court patrons in the Circuit Court of Cook County alone. The CBF continues to take primary responsibility for the three program sites in Cook County, which are located at the Richard J. Daley Center and the George N. Leighton Criminal Courthouse in Chicago and the Sixth Municipal District Courthouse in Markham. In each of these sites, full-time and part-time JusticeCorps members serve as docents for people without lawyers by helping them navigate the courthouse and connecting them with other services, helping them to find and use online resources, and making customized referrals to legal aid programs and other services. The volunteers reflect the diversity of our community, and many have strong connections to the client populations they serve and the ability to offer help to non-native English speakers in their own languages. The CBF and its partners recruit, train, and provide the necessary support for all volunteers to prepare them for their service. The program is an important complement to the legal assistance court-based pro bono and legal aid programs provide and increases the capacity of all court partners to deliver their services more efficiently and effectively. For more information about JusticeCorps in Cook County, contact Cortney Redman at credman@chicagobar.org or (312) 914-9521. For more information about JusticeCorps in other parts of Illinois, contact the Illinois Bar Foundation at (312) 726-6072.